1978-1982 C3 CORVETTE INSTRUMENT CLUSTER CENTER GAUGE BEZEL. CHROME PLATED AND PAINTED BLACK REPRODUCTION. A BRAND NEW CENTER GAUGE, RADIO AND CLOCK SURROUND BEZEL WILL GIVE YOUR C3 INTERIOR A FRESH LOOK! 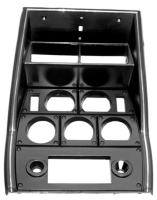 OUR REPRODUCTION DASH BEZELS HAVE THE CORRECT FIT AND APPEARANCE OF A STOCK PART. FITS: 1978, 1979, 1980, 1981, 1982 C3 CORVETTES. Log In To See Pricing 1978-1980 CORVETTE INSTRUMENT CLUSTER CENTER GAUGE BEZEL - MODIFIED FOR AFTER MARKET DIN SIZE CD PLAYER. PLASTIC. Log In To See Pricing 1978-1980 CORVETTE RADIO WITH PLASTIC GAUGE BEZEL - WITH USB & AUX PORT (NO CD PLAYER). MILLENIA SERIES. 160 WATTS. Log In To See Pricing 1981-1982 CORVETTE RADIO WITH PLASTIC GAUGE BEZEL - WITH USB & AUX PORT (NO CD PLAYER). MILLENIA SERIES. 160 WATTS.